A couple of weeks ago, I made the trek down to Pleasant Grove to attend a meeting of the Positive Birth Group hosted by Lauralyn Curtis. The Positive Birth Movement works around the world to surround birthing families with positive support. As a branch of this movement, Lauralyn’s group meets monthly to discuss birth topics, network, and strengthen each other. Birthing parents, doulas, midwives, and other birth workers all come together for a great evening of inspiration, education, and friendship. I went to the meeting on this night for two reasons: to take notes on the meeting itself since I am planning to start similar meetings up in the Salt Lake area and to connect with people in the local birthing scene. 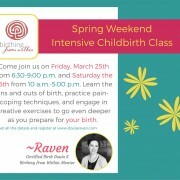 Her home was filled to the brim with eager participants–clearly, the message of positive birth is something that people are drawn to and crave! Lauralyn, a childbirth educator, hypnotist, doula trainer, and creator of her very own childbirth education curriculum gave a powerful class on what she calls the 5 Fundamental Birth Fears. I was so moved by this class that I wanted to share some notes here on my blog. Please note that these concepts are the work of Lauralyn Curtis. As Lauralyn explained it, birth fears can be grouped into 5 basic categories: Fear of Abandonment, Bodily Harm, Loss, Unworthiness, and the Unknown. One by one, she went through each fear and the group brainstormed synonyms for the essence of this particular fear and ways to counter each fear. Lauralyn closed the discussion of each fear with a positive affirmation to use in the face of that specific fear. Here is what was discussed. Synonyms: aloneness, separation, forgotten, unwanted, unseen, unheard. Counter With: togetherness, attention, connection, validation, communication, touch, eye contact. Synonyms: trauma, fear of death, fear of being out of control, loss of safety, being harmed. Counter With: safety, being cared for, being addressed, knowledge, experience. Synonyms: loss of anything that you value including self, youth, objects, mental health, your plans, belief, and who you want to be. Counter With: focus on gain, control, abundance. Synonyms: embarrassment, shame, guilt, less than, undeserving, unaccepted, unseen. Counter With: worthiness, self-worth, acceptance, self-love, validation, community of people that love you. Synonyms: the future, relationships, lack of security, feeling unprepared, transitions, not in control. Counter With: knowledge, experience, surrender, faith, confidence, willingness, acceptance, mindfulness. Powerful stuff, isn’t it? Not only did it reach me on a very personal level, especially as I consider how I parent and interact with my little ones, but it also moved me deeply as a doula. 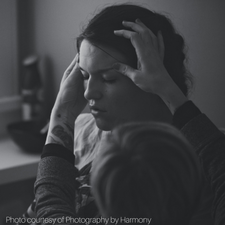 Because this is essentially what I do with each of my clients: I try to surround them with affirmations and encouragement and help counter these birth fears that can work so powerfully in each of us. I tell them, “I hear you” and let them know that I am with them and that I am not going anywhere. I tell them, “I know this is hard work, but it is good work. This is your baby coming to you,” as I apply counter pressure and rub their feet. I tell them, “You are making good choices for you and for your baby,” as they face a birth different from the one they had dreamed of. I tell them, “You are so powerful and you are doing so very well,” as I look them in the eye and wipe their brow. I tell them, “You are doing this right now. You are having your baby,” as I help them ride one more wave and keep them grounded in the present. Beyond this, I try to work with their partners because it is their birthing time, their period of transition, too. I model how to press just the right spot so he feels needed and valued. I remind him to take care of himself because he is working hard and might need a breath of fresh air. I delight with him over the strength of his partner and the miracle of his child. As I do all of this, my wish is that my clients look back on their births and marvel at their own strength and power, and not at how great their doula was. It’s a fine line to walk between saving and empowering, and one I am learning to tread better with each birth I attend. 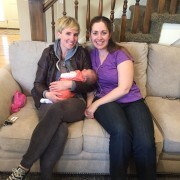 What Lauralyn taught rang true to me and spoke so deeply to my doula work. Birth is a time when all of these fears can combine and threaten to overwhelm us if we do not learn to recognize them, counter them, and surround ourselves with people that will hold that space for us. 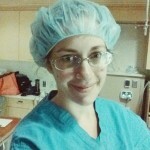 What an honor it is to be a doula.